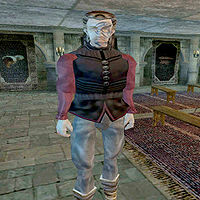 Frik is a Nord apothecary who works for the Imperial Cult at their chapels in Ebonheart. He has a selection of potions available for sale. He is one of the people who will allow you to join the Imperial Cult, and can provide you with a clue on where to find a particular type of shirt and vest needed for a quest. He is wearing a rare variety of common shirt, as well as a pair of common pants and shoes. He is also carrying a silver staff. Aside from his natural resistance to shock, immunity to frost, ability to shield himself, and a natural frost damage spell, he knows the spells Wearying Touch, Distracting Touch, Shockbloom, Poisonbloom, Lightning Storm, Absorb Health, Resist Poison, Resist Shock, Vigor, and Enrichment. Shirt and Vest for Harvest's End: Collect a red shirt and black vest for the Harvest's End festival. This page was last modified on 23 November 2018, at 06:06.